Yoga Certificates Templates – Yoga students, from beginners on up, and yoga instructors will loves these yoga award certificates. A perfect gift for your yoga instructor who can use these class after class, year after year. I’m a Yoga Kid (Boy). I’m a Yoga Kid (Girl). Yoga certificates are great recognition for yoga practitioners when a class has been completed or a level of expertise has been reached. 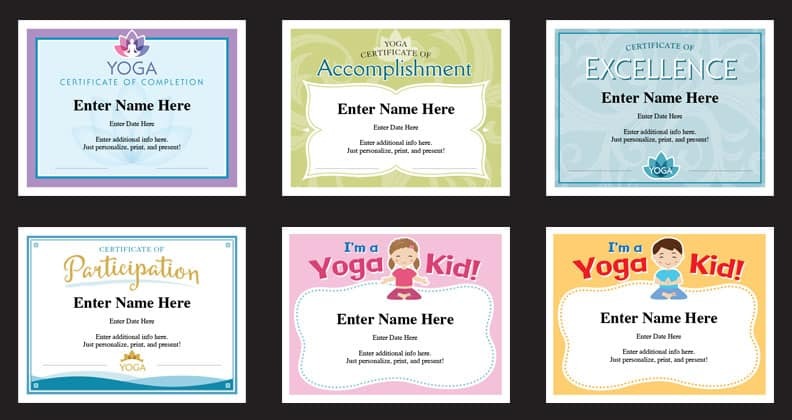 Award the “I’m a Yoga Kid” certificates to kids who are first introduced to yoga. With fun designs, these stylish certificates will look good on bulletin boards, in office cubicles and on the family fridge. With purchase, you’ll receive a link that will enable you to instantly download the PDF file featuring these 6 yoga certificates. PDFs work on Macs and PCs. Just make sure you have the latest version of Adobe Reader (which is available for free). Type in name, date, the yoga instructor, and other details into the text fields. Personalize, print and present! It’s that easy. When should you award a yoga certificate? There are many options. You can award certificates to students after a specific session. Or, you can wait until a certain accomplishment has been met, e.g. 100 hours of yoga training. Certificates are great for recognition and to help build confidence. When a yoga student needs a boost, that’s a great time to award a certificate. Kids will probably enjoy a certificate after every class. It’s up to you. There’s no need to be stingy as the cost is very minimal. These yoga certificates make great awards. Recognize achievement, build confidence and capture important moments with these yoga award certificates. These awards will help yoga practitioners continue strong in their yoga practice. Check out a variety of yoga poses and more at the Yoga Journal.